Ebola Virus Infection - body, viral, contagious, causes, What Is Ebola? Ebola hemorrhagic (e-BO-luh heh-muh-RAH-jik) fever is a rare viral disease that causes severe bleeding and results in death in up to 90 percent of those infected. 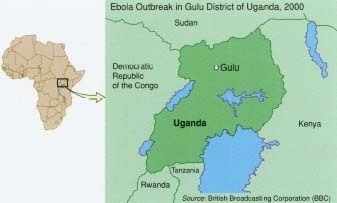 Ebola appeared without warning in late 2000 in the northern district of Gulu in Uganda, Africa. Health workers responded quickly, caring for people infected with the disease and isolating them so that they would not spread the devastating virus to others. Despite the workers' efforts, more than 40 people died in the first wave of the epidemic * , and the disease spread throughout the district and beyond. By February 2001, the epidemic had killed 224 people. Then, suddenly, it was over. The Ebola virus seemed to disappear back into the jungle. Although much remains unknown about Ebola, scientists have begun to piece together some of the puzzle. Ebola was first identified in 1976 in the Democratic Republic of Congo (formerly Zaire) and named for a river that flows through that African nation. 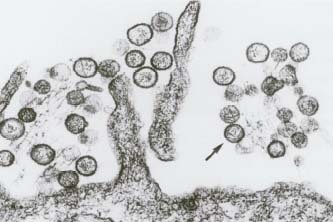 Part of the filovirus family, Ebola virus has four subtypes, each named for the location in which it was discovered: Ebola-Zaire, Ebola-Sudan, Ebola-Ivory Coast, and Ebola-Reston. The Ebola-Reston virus, first detected in the United States in 1989, was discovered in sick monkeys imported from the Philippines to a research laboratory in Reston, Virginia. Although a few laboratory workers later showed signs of the virus in the blood, none of them became ill.
Decades after its identification, researchers continue to search for the natural reservoir, or origin, of the Ebola virus. The virus probably resides in the rain forests of Africa and Asia. Scientists think that the Ebola virus is animal-borne (or zoonotic) and that it is passed to primates (monkeys and apes) and humans by another animal. In October 2000 an epidemic of Ebola broke out in Gulu, Uganda, and in 4 months it killed 224 people. Some doctors believe that eating ape meat contaminated with the virus may be one source of infection. It is hoped that research to determine the natural source of the virus and the ways in which it is transmitted to primates and humans will provide information about how to prevent future outbreaks. kills, the disease is actually quite rare. Since the virus was discovered, about 1,500 cases of Ebola virus infection have been reported in humans, and over 1,000 of those infected died. Ebola virus is extremely contagious * , but scientists do not know exactly how it spreads. They do know that it can spread through direct contact with infected blood, especially on contaminated needles, and possibly through the nasal or respiratory secretions of someone who is infected. Health care workers and family members tending to the people who have the virus risk becoming infected. The needles used to take blood samples are an extreme biohazard * because accidental needle pricks to health care workers can transmit the infection to them. Traditions in some African cultures may contribute to the spread of Ebola virus. For example, some funeral rites require a ritual cleansing of the corpse, which can bring a loved one into contact with the blood or other body fluids of the deceased. Also, ape meat is considered a delicacy in parts of Africa. Some scientists recommend that people not eat it because it might contain the Ebola virus, which can infect non-human primates such as monkeys and chimpanzees. * contagious (kon-TAY-jus) means transmittable from one person to another, usually referring to an infection. * biohazard is a biological agent or condition that causes a threat to humans. In the first few days after infection with Ebola virus, symptoms resemble those of other diseases: fever, headache, and muscle aches. The disease rapidly progresses to more serious symptoms such as rash, chest pain, severe bloody vomiting and diarrhea, uncontrolled internal bleeding, kidney and liver failure, and shock * . Doctors can diagnose Ebola fever based on symptoms seen in patients as they quickly become ill during outbreaks. Blood tests can sometimes identify the virus directly, or antibodies * to Ebola produced by the body during infection can be detected in the blood. Doctors have to be careful when performing tests because simply injecting a needle into a patient who is prone to hemorrhage * can trigger uncontrolled bleeding. There is no medication to treat or cure Ebola infection. Patients with Ebola fever are hospitalized and receive supportive care to treat symptoms. They may receive intravenous * (IV) fluids to protect against dehydration * ; monitoring of blood pressure, heart rate, and breathing; and treatment for bleeding or other infections that may develop during the illness. During past outbreaks, 50 to 90 percent of people who developed symptoms of the disease died. Those who survive usually recover in several weeks. Researchers have recently discovered a protein on the surface of the Ebola virus that is involved in attacking blood vessels, and this finding may help to explain the massive bleeding that leads to most Ebola deaths. Researchers are attempting to develop new drugs or a vaccine directed against this protein, which might prevent the disease or at least reduce the severity of the symptoms and the number of deaths caused by the virus. * hemorrhage (HEH-muh-rij) is uncontrolled or abnormal bleeding. An electron micrograph shows Ebola virus particles. spreading. However, as the epidemic in Gulu showed, even those precautions sometimes fail. Research efforts to determine the natural source of the virus and how it is carried to primates and humans will likely provide information about how to prevent future outbreaks. The tale read like something from a Stephen King novel. Ebola virus had infected and killed monkeys in a laboratory in Reston, Virginia. A biohazard SWAT team descended on the Reston Primate Quarantine Unit and, working in secret just miles from the nation's capital, struggled to decontaminate the monkey house. In his tense and terrifying book, The Hot Zone, Richard Preston recounts in detail how the U.S. Veterinary Corps at Frederick, Maryland, spotted Ebola at Reston in 1989 and recruited the secret SWAT team to contain the deadly virus. Scientists later named the virus subtype Ebola-Reston and determined that, although it is deadly to monkeys, it does not cause Ebola fever in humans. The following year, the same virus was found in monkeys in labs in Texas and Pennsylvania. Researchers were able to trace the infected monkeys back to a single exporter in the Philippines. In the United States, several of the monkeys died and four people were infected with the virus, although none of them became ill.
Preston, Richard. The Hot Zone. New York: Random House, 1994. A dramatic account of Ebola's destructive effects, including the story of Ebola-Reston, the virus that infected monkeys in a suburban Washington, D.C., laboratory. All the Virology on the WW W maintains The Big Picture Book of Viruses, which includes a catalog of virus pictures and a section on emerging viruses such as Ebola.